What happens when a smooth sailboat experience becomes dangerous and life threatening? Four kids who don't know each other and don't like each other are thrown together when their parents marry. The parents send the four on a sailboat adventure with their uncle Dexter and his first mate Jim. When the weather turns rough, their uncle tells the kids to go below in the cabin. The storm is too much for the boat and soon Dexter and Jim are launching the life raft. 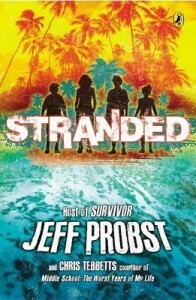 Jim and Dexter are swept away with the raft and kids have to weather the storm alone with no power and no mainsail. Eventually the kids are washed onto a rocky outcropping on an uninhabited island (shades of "Survivor")! Forced to work together, the four soon realize they only have each other. They are able to contact their parents and tell them approximately where they are--the Coast Guard is searching for them, but the search area is 500 miles wide. The kids set up a signal fire in case they see planes and learn to trap rain water for drinking water. They salvage what they can from the sailboat. 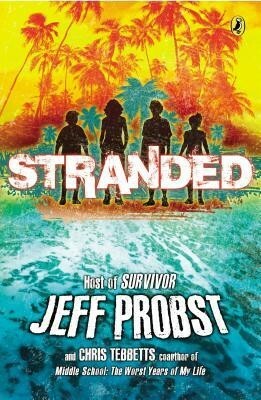 Jim and Dexter are rescued but the kids are running out of hope. When a huge wave takes the sailboat out to sea, they realize that they will have to survive with nothing but each other. Jane is the most remarkable character of the four children. She's smart, outspoken, and fearless. She's only nine years old, but she's the brains in this mixed family.